1BR/2BA,Gorgeous 10th Floor Oceanfront, Awesome View! 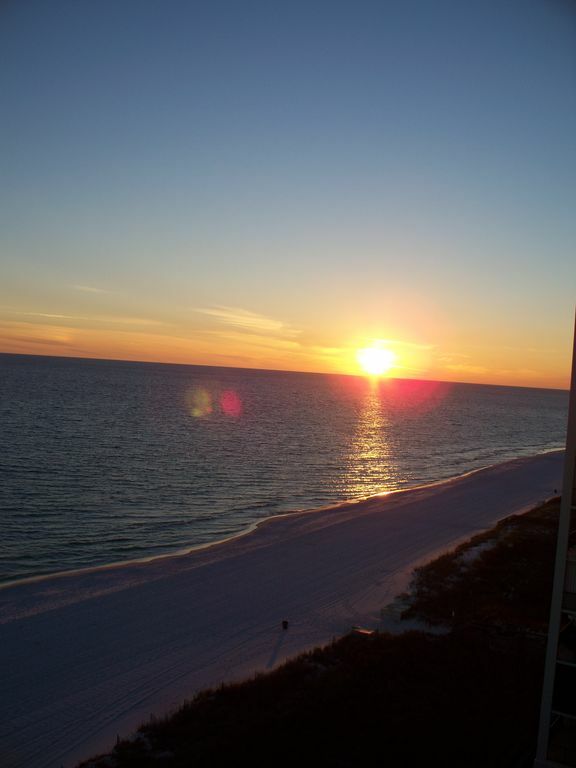 Enjoy a breathtaking view of the beautiful white sand beaches, Gulf of Mexico blue water, and unforgettable sunsets from our 10th floor balcony. This one bedroom, two bath condominium unit is beautifully decorated and has all the conveniences to make your stay truly comfortable You’ll easily sleep six people with an enormous king size bed in the master, a bunk bed in the hall, and a queen size sleeper sofa in the living room. The dining room table seats four and is separated from the kitchen by a breakfast bar that seats two. The well-equipped kitchen is sure to inspire fine culinary creations. Pelican Beach Resort features a selection of amenities which include a choice of three pools, , fitness center including wet and dry steam rooms, two tennis courts, and a hot tub, conference center, pool/beach bar, deli, tennis courts, covered garage parking, game center and much more! PELICAN BEACH RULES 2018 1)The first 3 rows will be reserved for the beach service and NO private chairs, umbrellas and cooler setups will be allowed in front of the Beach Service set ups. 2)Parents are allowed to monitor their children and take their chairs and towels within the "20 foot rule" in front of the service for periods of time. LA DOLCE VITA BEACH SERVICE (Tax not included) 2 Chairs & 1 Umbrella $35 a day $175 a week We provide Umbrella and beach chairs for our guests to use that to be installed behind the Beach Service umbrellas. Stayed at pelican beach for spring break with our kids, all 10 and under. This is a great spot for kids and families. We alternated our time between the beach and the heated pool. The unit was clean with a great view. Owner was very attentive as we let him know a DVD player wasn’t working and he had someone bring in a new one right away. Many dining options near by. Noted a couple of things that needed attention and contacted the property owner who immediately took care of the problems. On our second to last day there was a problem in the venting system with a loud noise coming from it. Unable to sleep due to the noise, at 5 am my husband went to the desk clerk who told us it was just the wind and to ignore it. He didn't even offer to contact maintenance. At 8 am my husband found two maintenance guys who came to the condo and listened to the noise. They checked into it for us and were very accommodating. In the mean time we decided to leave a day early and did contact the owner who was very apologetic. Later the owner called and said it was a loose fan causing the noise. We like this resort and will probably return next year although the weather was not as nice as the previous year. We would definitely rent from this owner again. Condo was nice and clean and had all the things we needed for the month to feel at home. Wonderful location overlooking the Gulf - Pelican is loaded with activities and very friendly people - the area is overwhelming with great restaurants and other activities, as well as shopping. The condo is very roomy and has two bathrooms with two showers. Appliances are new and the kitchen is well stocked with small appliances, such as a crock pot and blender. My wife and I felt so at home in this rental. The room was very nice and well furnished. I didn’t like how they set up the beach chairs from one edge of the property to the other it left no room for people like me to use my personal chair close to the water. I did however respect their rules but will find somewhere else to go in the future! Perfect ! had a great time! My wife and I have never been to the Panhandle as we usually vacation in Hilton Head SC or NC, We were surprised how beautiful the beaches are with the white sand that stay cool to your feet!